Hey! I got a Patreon page here! It’s a fun thing you could sign up for to help support the site. I have some fun cool stuff exclusively for Patrons! Check it out! There are many one sided conversations like this that happen every national holiday. The company is evil! How dare they! It’s not fair! Everyone should have the day off! I don’t mind working on national holidays. Extra pay, traffic is usually dead when I get off work, and my day off is in the middle of the week when everyone else goes BACK to work. 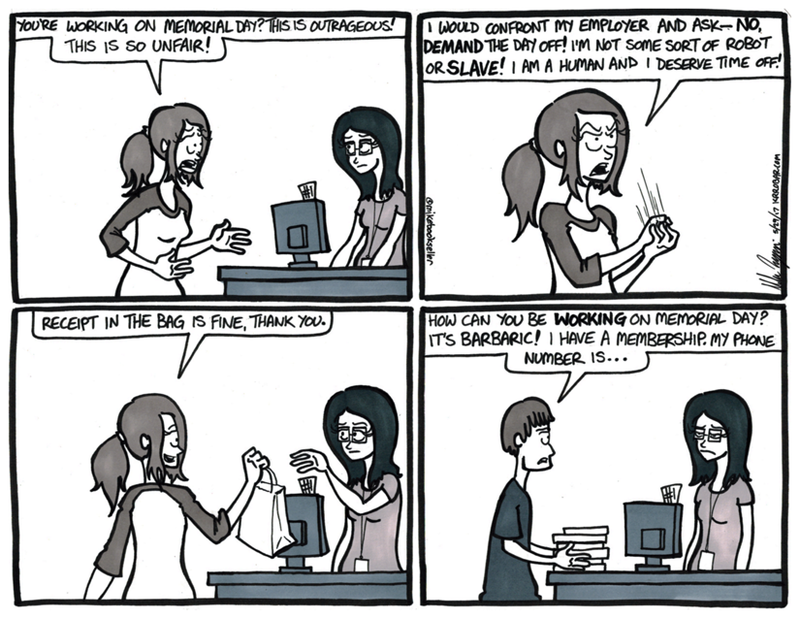 What gets tiresome is those customers who come up and try to empathize with you. It doesn’t help us feel better, and you leaving crap all over the store for us to clean up REALLY isn’t helping.